Sunday Salon: So I read some books - not many, but some. So....it's fair to say that this is my worst year for reading, reviewing and blogging in nearly 10 years. I am not really reading, certainly not reviewing and blogging is sporadic at best. Today, at least, I thought I would at least give a Sunday Salon post a go to share my May to October reads. It is a far cry from the months where I averaged 20 or so books in a month. In September, for example, I read just one book. I listened to another but actually reading - just the one. Unthinkable. When I read Isla and the Happily Ever After I read it in a day which is almost a return to my old normal way of reading but it did make me realise a couple of things about the role of reading in my life before and has given me some food for thought about what it's role should be in my life now. I did start to compose a blog post about that in my head. Who knows. Sometimes in the next week I might even get around to starting to put some of those thoughts into a blog post that might be published. House of Memories by Monica McInerney (or at least that is the book that I am carrying around with me. One of the things I have been trying really hard to do since I started on this weight loss journey is to try and find some recipes to use that somewhat approximate the food that we like to eat on a regular basis. 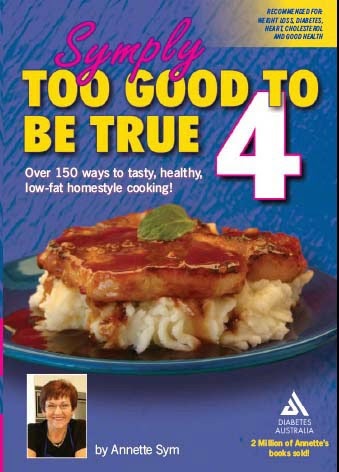 One of the better books I have found for this is a series called the Symply Too Good to be True series of cookbooks by Annette Sym. At the moment there are 7 books in the series and I think there are multiple recipes in each book that I might make in due course. There are a number of things that I like about this series. One is that most of the recipes are relatively simple to make and not overly time consuming. I like that there are recipes for foods that you would eat quite regularly. For example, so far I have tried a low fat recipe for lasagne which the boy now prefers to the way that I used to make lasagne and healthy version of pizza. Another big hit in my house has been the low fat version of chicken parma. The boy either thought it was so good on Wednesday night he ate the equivalent of 2 and a half chicken breasts (I am not sure if he hadn't eaten all day and was therefore starving after basketball or if he is growing again or it was that good!!). Another thing I like is that nearly every recipe has a comment from a dietitian as well a nutritional panel showing calories/kilojoules, sugar, sodium etc. The comments might vary from a factual comment to an opinion. For example, on the chicken parma, the dietitian said something along the lines of finally a parma that tastes just like you get from the pub. Now it was good, but to compare it to a pub parma is possibly taking things a bit far. Sometimes the comments are simply this may be low fat but there is very little nutritional value so maybe not if you are trying to lose weight or have diabetes. Of course that is usually on the baking and desserts section but there are some exceptions which I might end up trying eventually. For a lot of the recipes there are also the nutritional details for variations for the recipe. For example, in the recipe below the suggested variations include rump steak, pork steak or tofu. The author has lost a lot of weight and kept it off over an extended period of time and in every book there are a couple of pages of testimonials which certainly help at times when the motivation is flagging a little bit. Annette Sym has created something of an empire with retreats, mentoring, website, videos and so much more! There are a couple of things I don't necessarily like that much. Because there is an emphasis on simplicity and time savings there is a heavy reliance on items like crushed garlic and ginger in a jar, tomato soup and stock powder as examples. Whilst I don't have an objection to the ginger, I don't get the always using precrushed garlic - maybe I am a little bit of a cooking snob! There are also some odd food combinations at times but maybe these are every day foods for other people! Tonight I am trying a new recipe from book 4 and that is Butter Chicken. If there is a particular curry that we eat on a regular basis then it would be Butter Chicken, a very mild curry. This may be a bit of an oxymoron though because whilst it is an approximation of butter chicken there isn't a single bit of butter in it at all! Luckily, there is chicken. Having now had dinner, I think it is fair to say that this is another winner in this house. Whilst the sauce ends up being a bit gluggy (maybe I boiled it too long) it certainly tastes like a mild curry and because you are adding all your own spices there is no reason why you couldn't add a touch more chill or paprika or whichever. I did cook my onion, garlic and ginger before adding my chicken because that is how I always do it. I also mixed the cornflour with a small amount of the milk to make a paste and then added the rest of the milk. Other than that, I pretty much stuck to the recipe as it is written below and I served it with basmati rice and steamed broccoli. Cut chicken into bite sized pieces. Coat a large non-stick frypan with cooking spray, saute chicken, onion, garlic and ginger until chicken pieces are nearly cooked. Add all the spices and stock powder. Combine with chicken for 1 minute. Add tomato paste and fold through chicken.. 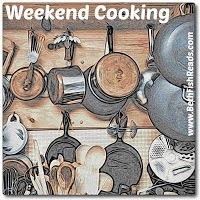 Blend cornflour with milk then add to pan, stir continuously mixing well until boiled. And down the bottom where people might not notice I will just put an update of where I am at. This week I passed a milestone which is 30kg (66lbs) lost from the heaviest weight I remember (which might not be the heaviest weight I was). I will try and get a full length photo to put up soon. It is getting harder to keep the motivation going in some ways but I am hoping that this is just a matter of pushing through to keep going. Still a long way to go but that is a pretty decent start.